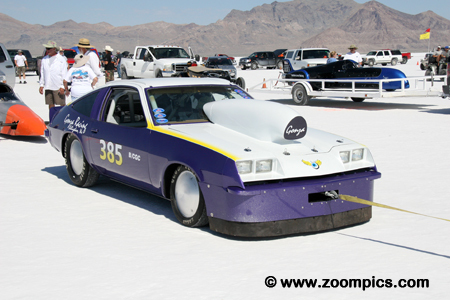 After a two-year absence, the Southern California Timing Association and competitors were back at the Bonneville Salt Flats for SpeedWeek 2016. Poor salt conditions and inclement weather prevented the event from taking place in 2014 and 2015. With a record number of entries, the event was held from August 11 – 19. 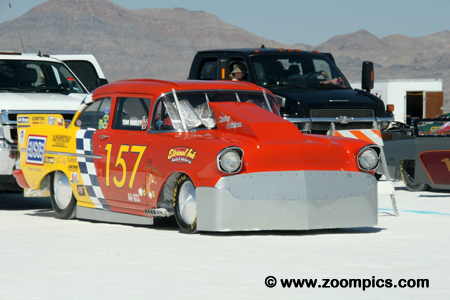 Vehicles racing at the Salt Flats compete in one of seven broad categories depending on their construction and the technology employed. Within each category are a number of classes. Special Construction Category: This represents vehicles competing within the quickest classes. These are hand constructed vehicles not modified production cars. Within in this class, there are Streamliners (covered-wheels) and Lakesters (open wheels). Modes of power in these classes are gasoline, diesel, electric and turbine engines. Vintage Category: This category is for cars produced before 1948. Classic Category: This category is restricted to coupes and sedans produced been 1928 and 1981. Minimal modifications are allowed to the bodywork and engine management systems are limited to OEM designs. Modified Category: This category includes domestic and foreign coupes and sedans. These vehicles have been modified so that they do not meet the rules of other categories. Production Category: Vehicles in this category have a very limited number of modifications. It includes – production based coupes, sedans, grand touring sports cars and pickups with different induction systems. Diesel Truck Category: This a catchall for diesel trucks constructed with varying degrees of technology. Motorcycle Category: This category includes production, modified, special construction, streamliner and sidecar classes. Despite less than ideal conditions, racers were able to establish a number of new records. Ten drivers ran fast enough to join the 200-mph Club. 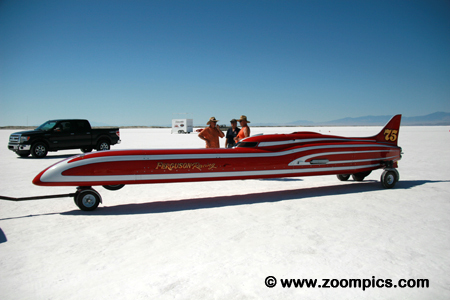 The quickest of all the competitors during the week was George Poteet - he recorded a speed of over 416-mph. 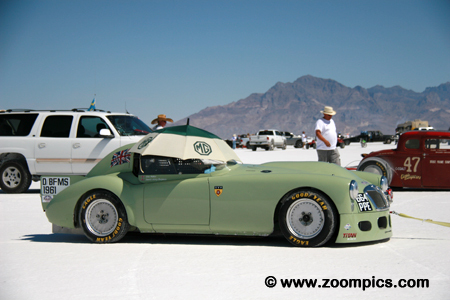 Weird and wonderful creations can be seen at Bonneville. In addition, to the racing vehicles, there are all kinds of Vintage, Hot Rods, Rat Rods, Customs and what can be best described as ‘other’ creations. 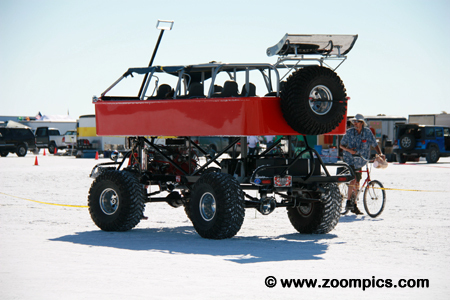 For example, this oversized multi-passenger, V8-powered, four-wheel-drive wagon is just one of many unique vehicles appearing at Bonneville Salt Flats speed events. 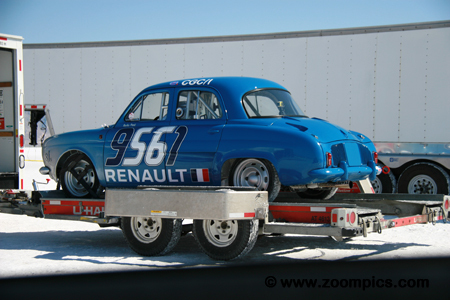 This 1956 Renault Dauphine was entered by the owner Hugues Portron of Colombes, France. The Dauphine was produced from 1956 to 1967 and is a rear-engined car equipped with an 845-cc motor. This vehicle was entered in the Classic Gas Coupe class. Handling the driving duties was Nicholas Prost. 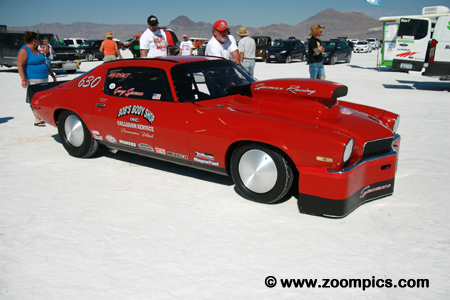 At SpeedWeek he had a record run of 76.541-mph. This car is classified Gas Competition Coupe (C/GCC) in the Modified Category. It is a 1953 Studebaker which is powered by a 368-cu.in. Chevrolet V8 engine. 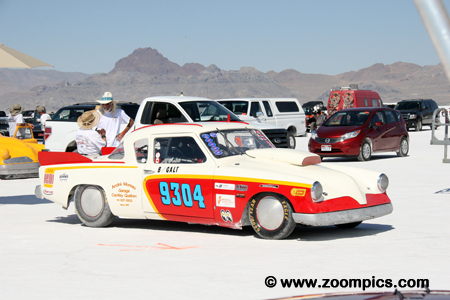 The Studebaker is owned by Terry Coe and he shares the driving duties with Peter Thompson. Previously, this car has run a best of 265.618-mph. 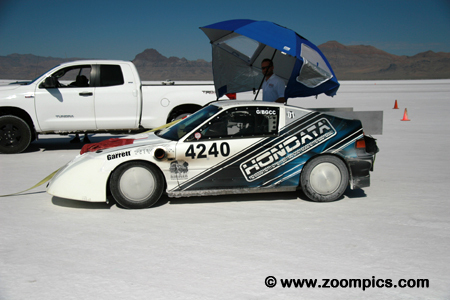 Another car competing in the Modified Category is this Blown Gas Competition Coupe (H/BGCC) Honda. This 1990 Honda CRX uses a 1.5-liter four-cylinder engine. In previous efforts, this car has gone 222.129-mph but at the 2016 SpeedWeek event, it set a new record of 227.644-mph. The car is owned by Doug Macmillan and entered by Macmillan Performance. Aaron Hales shares the driving with Macmillan. Spencer Racing entered the 1971 Chevrolet Camaro in the Classic Gas Altered class (AA/CGALT) which is in the Classic Category. The car is owned and driven by a Utah resident, Gary Spencer. The Camaro is powered by a 565-cu.in. Chevrolet engine and has run 246.411-mph. The beautiful 1929 Ford Roadster competes in the Vintage Category. Sharing the driving duties are Alan Fogliadini and Ed Marlen. Owner Doug Robinson and Crew Chief Marlen have fitted the car with a 370-cu.in. Chrysler V8. 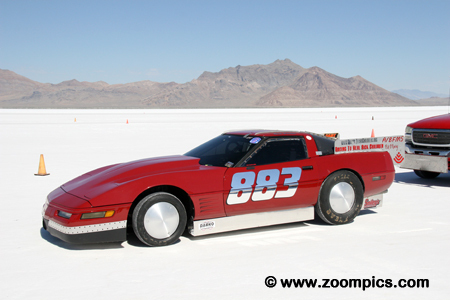 Entering the 2016 SpeedWeeks event this car’s fastest speed was 286.329-mph. 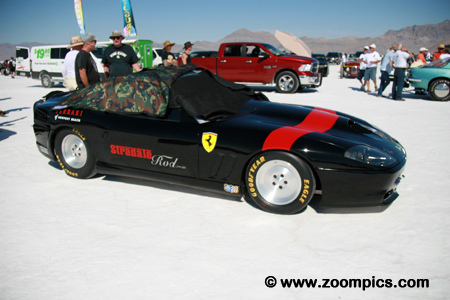 A lot of Chevrolet Corvettes are entered in the Grand Touring Sports class but there are exceptions – for example, this 2001 Ferrari 575 owned and driven by Kenneth Roath. A stock 575 has 349.8-cu.in. V12 engine which produces about 510-horsepower. It is also equipped with a 6-speed manual transmission and boasts a top speed of 202-mph. 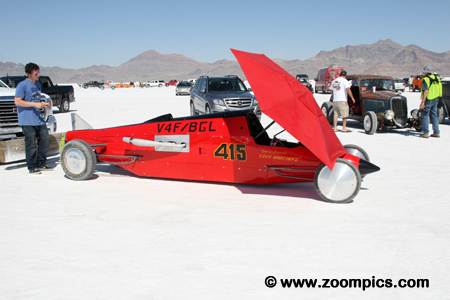 Falling within the Special Construction Category is this Fuel Streamliner class (B/FS) entered by Ferguson Racing. The 2014 Ferguson Streamliner is owned by Don Ferguson. The car is driven by Don Ferguson III and Don Ferguson Jr. Equipped with a 421-cu.in. 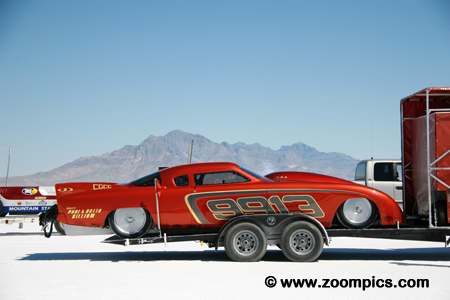 Ardun Chrysler V8 this streamliner went 349.939-mph during SpeedWeek which was a new record. Of note, the Fergusons are responsible for producing the Ardun engines. This 1953 Studebaker is powered by a 572-cu.in. Dart V8. Dart has been building racing engines since 1981. Initially, they offered modified Chevrolet engine components but now produce parts for Fords and Hondas. This Studebaker is owned by Loyd Huffman – he shares the driving duties with Sumner Patterson. 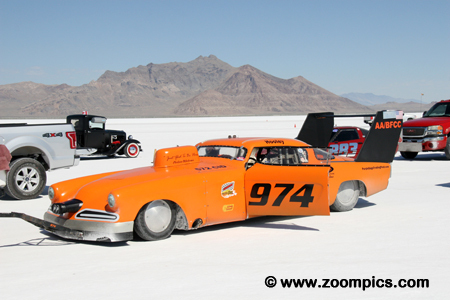 This Blown Fuel Competition Sedan (AA/BFCC) car has gone 249.832-mph. 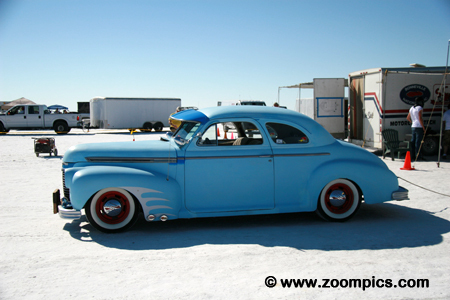 One of the quicker cars entered at SpeedWeek was this streamliner from Nish Motorsports. 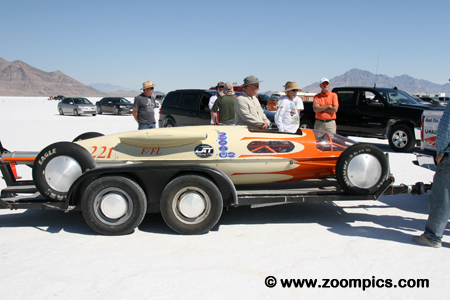 This car competed in the Fuel Streamliner class (AA/FS). The 2000 Nish Streamliner is equipped with a 520-cu.in. Darien Hemi V8. This local entry is driven by Mike Nish and owned by Terry Nish. In the past, this car has achieved a speed of 344.114-mph. Rick Harden of Motorhead Racing entered this 1992 Chevrolet Corvette. Running in the Blown Fuel Modified Sports class (A/BFMS) this Corvette has a 477-cu.in. Chevrolet engine. Harden also the driver of the Corvette. The No. 5100 is a classic example of a Lakester. This Special Construction Lakester was entered by Saltflyer and is a Benham Lakester with a 565-cu.in. Dart V8 engine. Sharing the driving duties are Anthony Zizzo and the owner John ‘Ted’ Glenhill. There were a number of entries from Canada. Included among them, was this Gas Altered Coupe (B/GALT) Studebaker from Cantley, Quebec. Owned and driven by Andre Moreau this 1953 Studebaker has a 392-cu.in. Chrysler V8 under the hood. 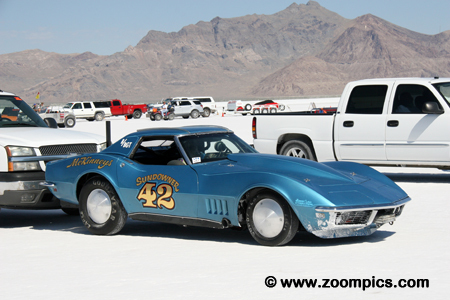 The Sundowner entry is a 1968 Chevrolet Corvette owned by Duane and Suzanne McKinney. The car is driven by Duane and Dave McKinney The Corvette competes in the Blown Grand Touring Sports class (B/BGT) and is powered by a 386-cu.in. Chevrolet engine. It has achieved a top speed of 251.838-mph. Competing in the Classic Category was the No. 385 1978 Chevrolet Monza. This car was fitted with a 422-cu.in. motor and prepared to run in the Classic Gas Coupe (B/CGC) class. 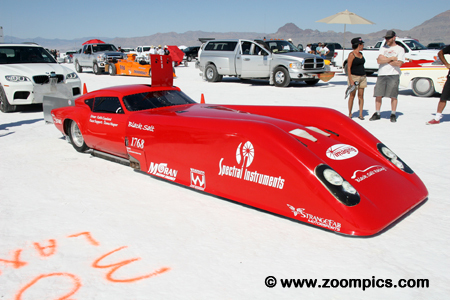 Owner and driver John Gardiner had previously attained a speed of 226.377-mph. This Blown Gas Lakester class (V4F/BGL) car was entered by Disturbing Da Peace. Owner Greg Martinez shares the driving duties with his Crew Chief Joseph Martinez. This Special Construction Lakester is powered a 192-cu.in. four-cylinder Ford. 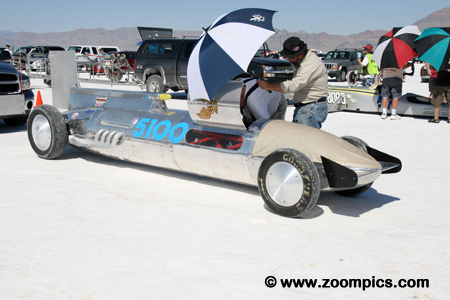 During SpeedWeek this vehicle had a record run of 163.811-mph. 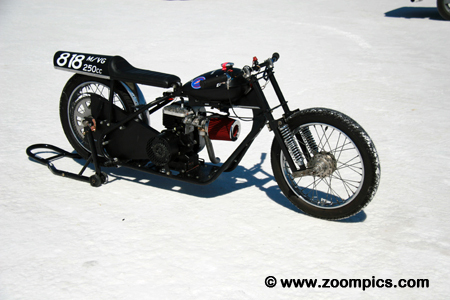 Motorcycles were well represented at Bonneville with a broad range of bikes. Walter Groff Racing entered this 1955 Cushman 356-cc. Powering this motorcycle is a Cushman Flathead. Since 1901, Cushman has been known for producing commercial and utility vehicles. 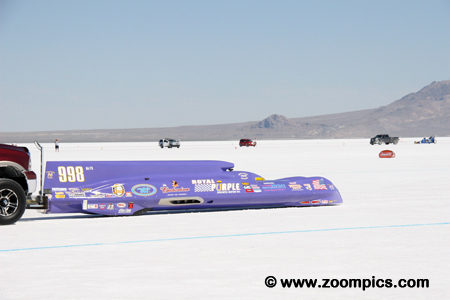 Owner and rider, Groff, has recorded a speed of 77.306-mph. 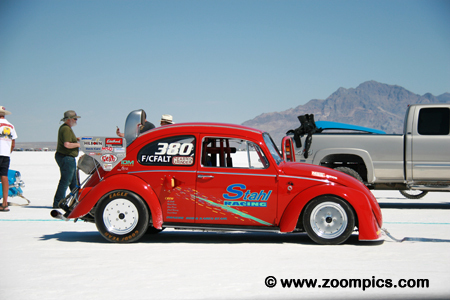 Before being converted for the Bonneville Salt Flats, this 1965 Volkswagen Beetle was a daily driver for the owner’s daughter. The original Beetle was produced from 1938 to 2003. The early cars produced 25-horsepower and were capable of 62-mph. The largest displacement engine used in production was 1600-cc. 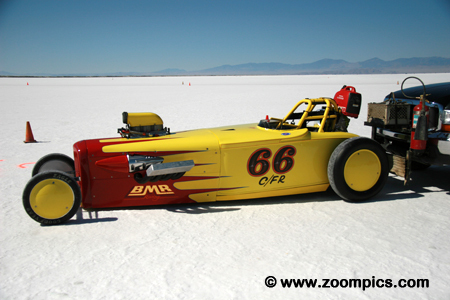 The Bob Stahl Racing entry has a 2925-cc motor and this car has reached a speed of 165.224-mph. Somewhere behind the front end of this Blown Fuel Modified Sports class car is a 1971 Triumph GT6. Triumph built the GT6 from 1966 to 1972 and it was equipped with a 2.0-liter Inline six-cylinder motor. As with other modified class cars the engine has been replaced and now uses a 364-cu.in. Chevrolet. Owner, Keith Copeland has gone 364.051-mph in this car. One of the many Lakesters in attendance was the No. 221 of Liberty Garage. This 2005 Lakester is powered by 180-cu.in. four-cylinder Arias engine. Arias located in Gardena, California, has been producing performance engines and engine components for many years. This Lakester which runs in the Fuel Lakester (F/FL) is owned and driven by Steve Nelson. This is a Gas Roadster from Mixed Nuts. The Gas Roadster class is very popular and has a large number of entries with various engine configurations, displacements and induction systems. 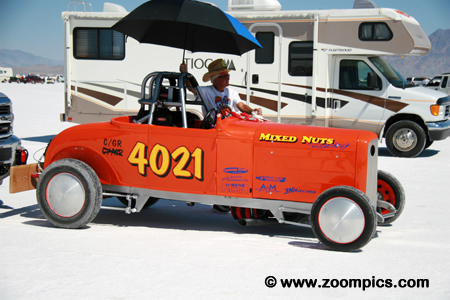 The Mixed Nuts car is a 1930 Ford Roadster with a 355-cu.in. Chevrolet V8. Owners Mike Bradley and Bill Miller share the driving duties with Ron McGuire and Kevin McKeehan. 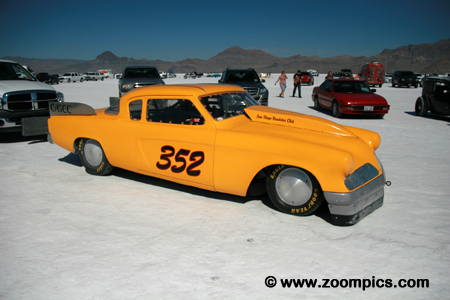 Stupidbaker Racing entered this beautiful 1953 Studebaker. Owned by Paul Gilliam and driven by Don Enriquez the car is powered by a 362-cu.in. Chevrolet engine. It competes in the Gas Competition Coupe class which is in the Modified Category. The 1957 Chevy has been a popular choice among the performance crowd for many decades – despite being about as aerodynamic as a brick. With this in mind, owners Tom Hurley and Joe Nelson, have modified the front end of this car to ensure clean air travels over the top of the Chevy. This ’57 is powered by a 632-cu.in. ‘Big Block’ Chevrolet engine. The British Motor Corporation produced the MGA from 1955 to 1962. Early examples were fitted with a 1.5-liter engine but by the end of their production run, 1.6-liter motors were installed. This MGA is entered by Walker – Chapman Performance Engineering and is powered by a 5.0-liter Ford. It competes in the Blown Fuel Modified Sports class where it has a recorded speed of 222.961-mph. 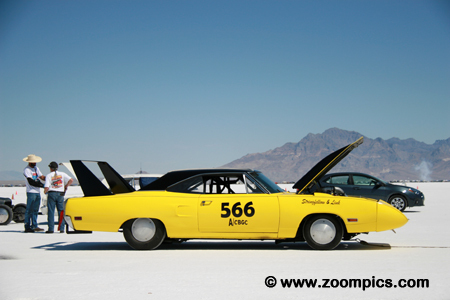 The 1970 Plymouth Superbird was based on the Plymouth Road Runner but modified to compete in NASCAR. Production of this car ceased after 1970 due to NASCAR’s ban on these specially designed aero cars. The Superbird was available with three engine choices: 426 Hemi, 440 Super Commando and 440 Commando. This Stringfellow and Link Superbird has a V10 motor from a Dodge Viper under the hood.